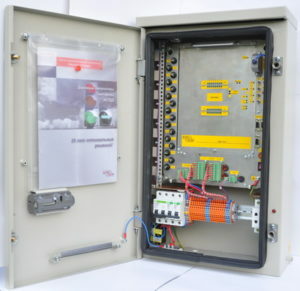 SPE «System Service» presents its new developments, single unit controller KDK-16-05 and sound signalisation device for blind pedestrians UZS-01. Controller KDK-16-05 is intended for traffic flow regulation on small and medium itersections. It has the same functional possibilities as standart KDK controllers with significantly smaller dimensions, weight and price. Sound signalisation device UZS-01 is intended to increase safety of intersection crossing for blind pedestrians provided by sound signal.